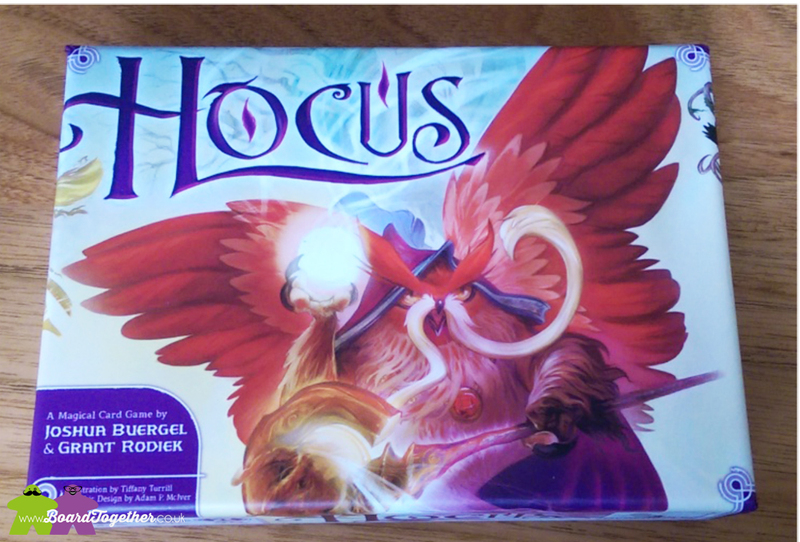 Hocus is short, card based game based on Poker, with a magic twist. Players compete to win points by winning poker hands, using numbered cards in four suits, and a personal selection of magic spells. It’s a well thought out game that plays quickly but with plenty to think about. 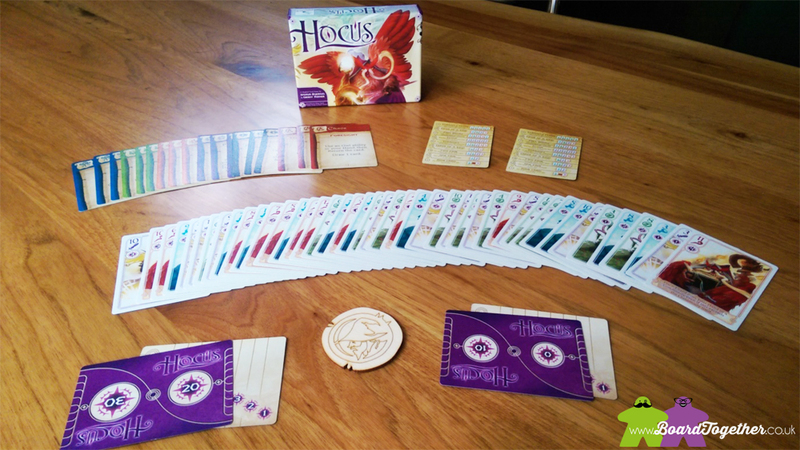 Hocus was published through Kickstarter in June 2015, and fulfilled ahead of schedule (as if by magic). The box is sturdy and compact – no wasted air space at all, and the cards are a high quality playing card grade with a linen finish. The art is detailed and colourful (and colour-blind friendly), and the suits are easily distinguished. Text is clear and easy to read, and individual player cards offer a handy reference during the game. 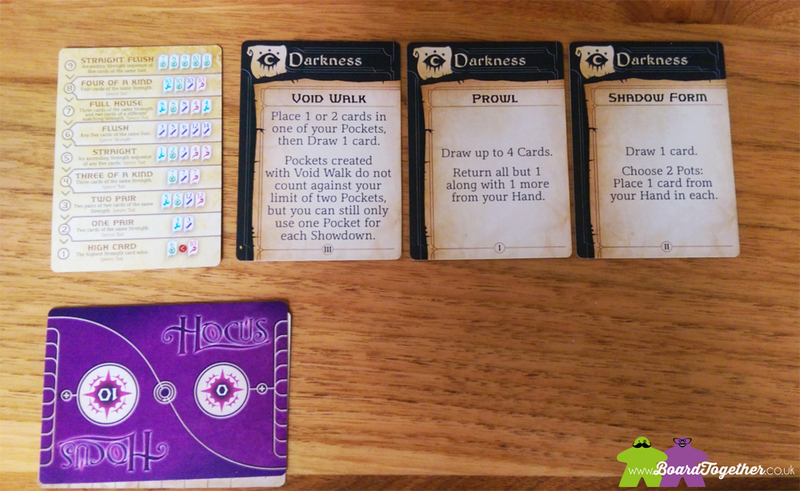 To set up, each player picks a type of advanced spell cards (choosing from Darkness, Chaos, Alchemy, Chronomancy, Storm, Illusion, Flame and Enchantment). These offer three different spells, which can be used as actions each turn. 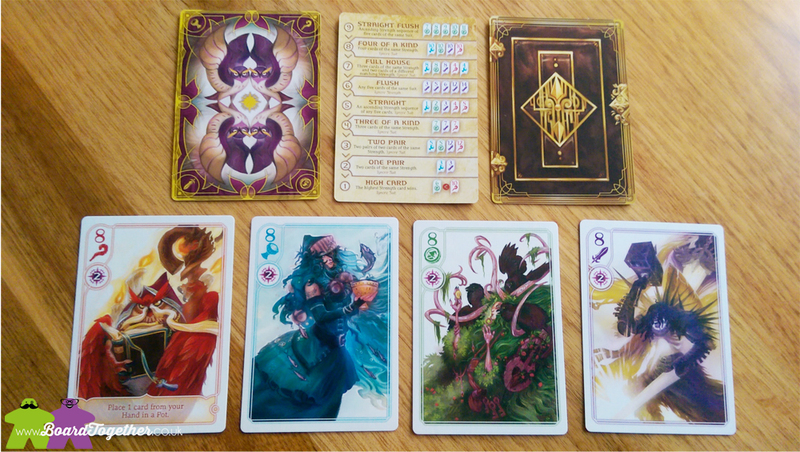 The advanced spell cards are quite thematic and offer different ways of approaching the game. The game is played with a deck of four suits, one of which is the owl suit. Owls are used as standard cards, but if won in a pot, can be used as magical abilities in future rounds. The standard hierarchy of poker hands is used, reducing the learning curve for new players. Each turn, players may add cards to the community (the shared cards on the table – think Flop, Turn, and River from Texas Hold’em), one of their two pockets (the cards used to make up the poker hand with the community), or the pot. Each community has a pot that can be increased as the game progresses. Advanced spell cards offer ways to add a twist to the basic game actions, e.g. by playing cards face down, drawing more cards from the deck, swapping pots, etc. Once all the communities are full (4 cards), each player gets one final turn before showdown. At showdown, players nominate which pocket they will use to compete for the community. The best poker hand wins the pot – awarding points, and possibly owls. Learning the game is a breeze for those with some familiarity of poker, and for that reason it sees of a lot of table time at our house. It’s a clever twist on an older theme which improves the poker experience for lower player counts. The length of the game can be set at a certain points tally, or a number of rounds, which means it can be a short 15 minute filler or longer as you see fit. Quick set up and pack down, and a small box footprint adds to the games portability and storage. The game offers a good level of depth, particularly planning so you can use your best cards to win the community, but still have enough left over to place in the pot. 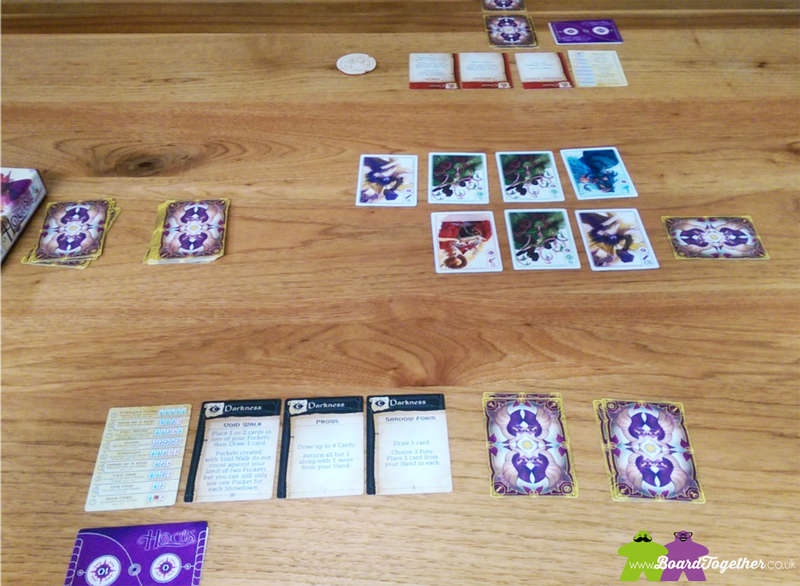 Playing your opponent, double-bluffing and scheming also blend in nicely to the gameplay, offering competition without confrontation. 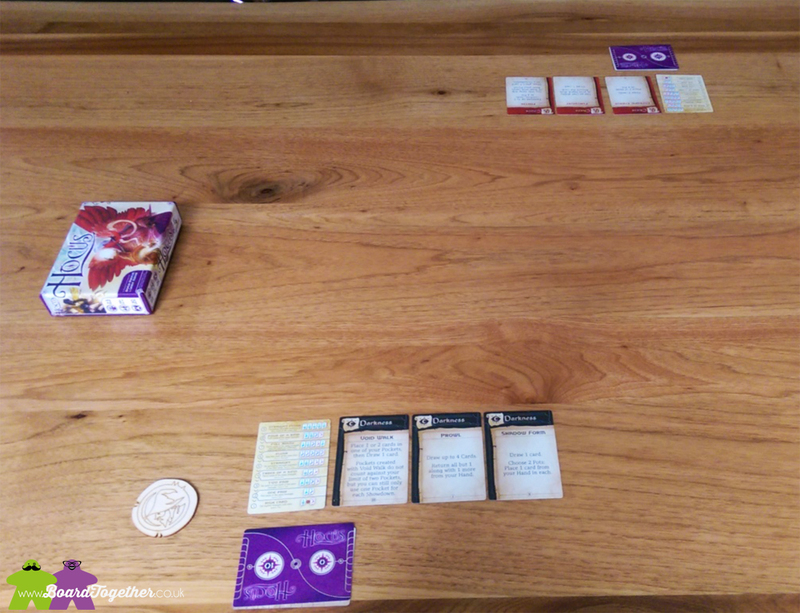 Although we haven’t played the game with larger play counts, the thought that has gone into the game and the scaling in the rules (more cards, communities, etc.) suggest the game would work just as well right up to 5. Overall, it’s an excellent game that will charm its way into your hearts and gaming schedule. This is such a kind and wonderful review, thank you. Thank you for sharing this!